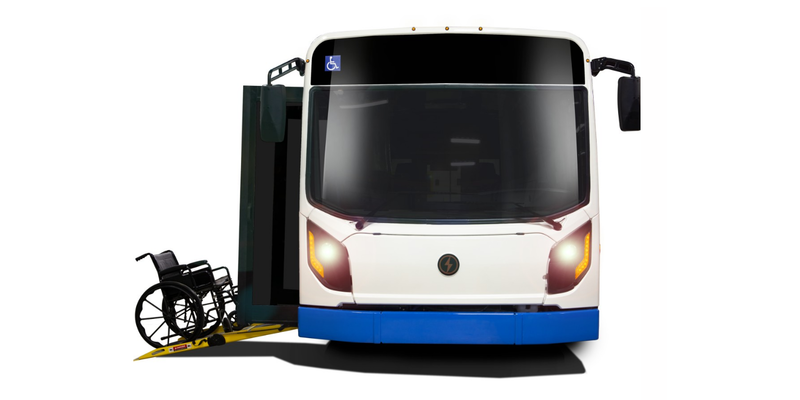 Canada’s Lion Electric is expanding its portfolio beyond electric school buses. Their latest strike is a minibus designed for paratransit, that is transport for physically challenged persons, and other public transport. Lion Electric has been making electric school buses for some time but recently announced they were working on a whole suite of electric commercial vehicles at its factory in Quebec. The first to see the light of the day is a mini-bus that is to open a new market for Lion. With features such as the integrated “Bi-Fold” access ramp and vehicle kneeling system, Lion Electric wants to vow the paratransit market and responds to the needs of people in wheelchairs for example. Their 149 kW strong eLionM can carry up to 22 passengers and will be offered with two battery options, 80 or 160 kWh for a range 120 km or 240 km per charge respectively. A 19.2 kW charger is embedded while a fast DC charge (SAE-Combo) is available as an option. The eLionM also features battery swapping with the packs coming from LG Chem. The eLionM electric minibus will become available in North America this summer. Furthermore, the Canadians want to launch their LionA around the same time. It is an electric minibus designed to meet school transport requirements. Lion will also start manufacturing a new line of all-electric trucks in 2019. The company is specifically looking at specialty medium to heavy-duty urban trucks (classes 5 to 8). The vehicles will range from ambulances, service trucks, cranes and delivery trucks.